Without question, Tom Hanks is the most interesting aspect of this film. At this point in his career, it's kind of hard for him to disappoint. He did an excellent job of showing us the PTSD (Post traumatic stress disorder) that his character's traumatic experience. What I did enjoy was the sequencing of some of the story telling. For the majority of the movie, we don't know the actual true events that transpired and that keeps you engaged to the end. Another positive for the plot was the dynamic between computer simulations vs human judgement. In this tech driven world, it was interesting to see how those two elements collide. Despite the fact that most people know the ending of this story, it still ends up having a minor payoff towards the end with a slight twist. Lastly, I thought it was a nice touch to highlight the rescue workers of New York and not just focus on Captain Sully alone. While this movie may have only been just 95 mins long, the pacing still made it feel a little longer than it actually was. (But that's not really a problem) My biggest issue with this film is the editing. Yup, that means I'm speaking ill of Director Clint Eastwood's work. (Bust out the holy water!) The flashbacks, and there were many of them, made the movie feel convoluted. In some areas they made sense (visiting Sully's flight experience, for example). However, there are other instances where the flashbacks happen out of nowhere, and appeared to be a little confusing with the sequencing of events. One moment you think you're in current time, then all of a sudden you realize that you were watching a flashback the entire time. To make matters even worse, one of the major flash backs is repeated again. It would've been fine had that event been repeated and shown from a completely different perspective, but it wasn't. So unfortunately, the movie has almost an extra 15-20 mins that could've been done away with. If you're like me, then after watching the trailer, you probably thought that this was another version of Denzel Washington's film, Flight. In a sense it was kind of like Flight, except take out the drugs and the Hollywood extra stuff like planes flying upside down. This film felt more like it had the push for award season, rather than appealing to general audiences. 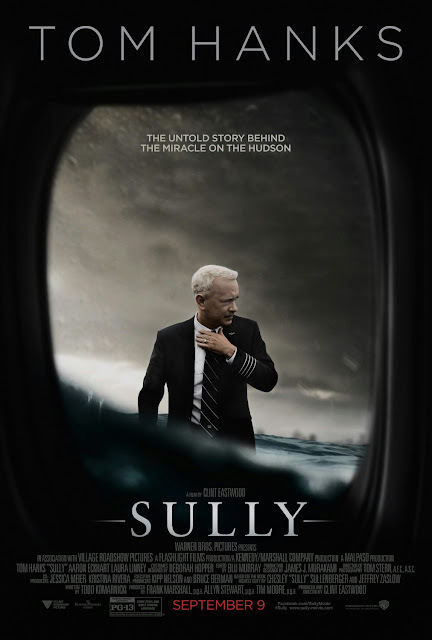 Sully was okay, but nothing I'd be in a rush to go see again. I more than likely wouldn't recommend this for a theater viewing unless you REALLY were intrigued by the trailer. At the VERY most, IF you wanted to watch it in theaters just do it as a matinee. In my opinion, you can wait on this film to watch at home. I get the feeling it'll be on TNT or TBS pretty soon anyway.